Happy Halloween! October turned out to be a pretty good month on the dividend front. This month is always great, if you like spending a lot of time raking leaves. Earlier in October we had very mild weather, but now it has been cold and rainy and all the leaves seem to have come down at once. The markets were pretty solid throughout the month. However, I decided to stay on the sidelines this month and made no new stock purchases in my portfolio apart from regular contributions to my ETFs. The S&P500 stayed above 2,500 by the end of October. 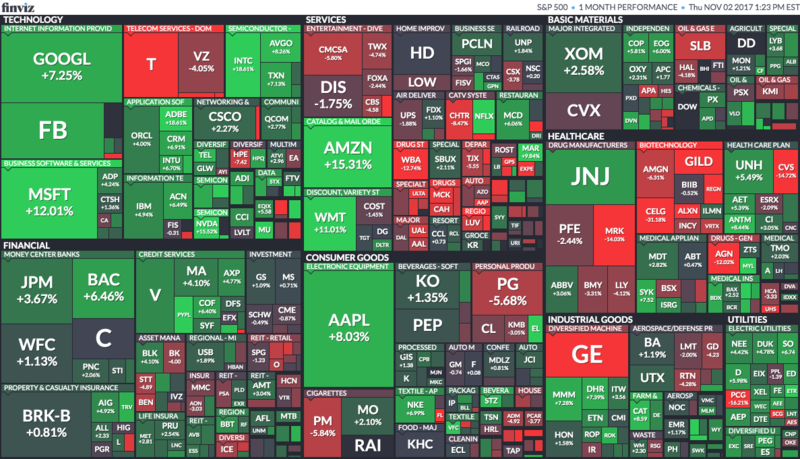 All three of the main indices I follow saw gains through the end of the month: S&P500 +2.25%, NASDAQ +3.50%, TSX +2.60%. Several key dividend foundation stocks were less green in the map below, but I still stayed on the sidelines in order to build up towards a purchase later in the quarter. October was a pleasant surprise in terms of dividend income! I wasn’t expecting much to be honest, as I have found October and November to be relatively quiet in the past. My October 2017 dividend income pushed my annual total up to new heights. My total for the year now stands at $138.78 nearly $10 more than my 2016 total and we have two months to go! I’m still working on my foundation, but it the power of dividend increases is clearly on display as my purchases have been quite limited since mid 2016. When compared to October 2016, my dividend income grew by 38.6%, from $13.63 to $18.89. This is rather impressive to me as this is typically a quiet month as it is not the end of a quarter. It shows the impressive growth of a few key holdings (Canadian banks) and some new names on the list from my ETF holdings. I’ve been working a bit more on the ETF front lately to diversify my holdings overall and to hit some of my own personal geographic and sector allocation targets. Looking ahead, I’ve got some interesting ideas on my shortlist for a potential stock purchase in November or December. I’m curious to hear how others are looking at their portfolio in terms of sector and geographic allocation. Which tools do you use to accomplish this task? Thank you for checking out my blog. If you have a DGI blog, I would be interested to hear from you so I can update my blogroll. Keep sharing your dividend growth posts. It is great to see the analysis and shout outs to fellow bloggers out there. Nice year-over-year growth. Trust me, it doesn’t take long for those dividends to start adding up.